I was told that- at the end of the day- it doesn't matter if the church burnt down, it will still be a perfect wedding if you end up married to the guy waiting at the end of that aisle. Well, thank goodness the church didn't burn down (Not sure Pastor Karen would have felt quite the way my well-meaning advice-giver did), but it is true. 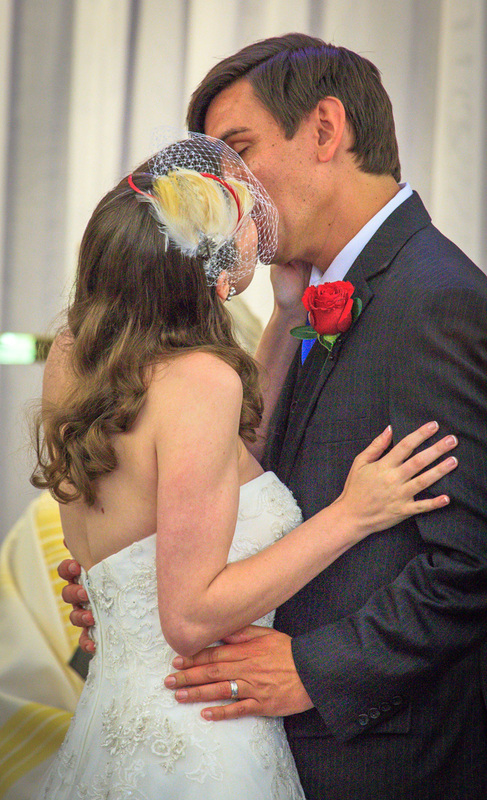 I truly felt our wedding was perfect, because I stood up before God and vowed to be with this man forever. 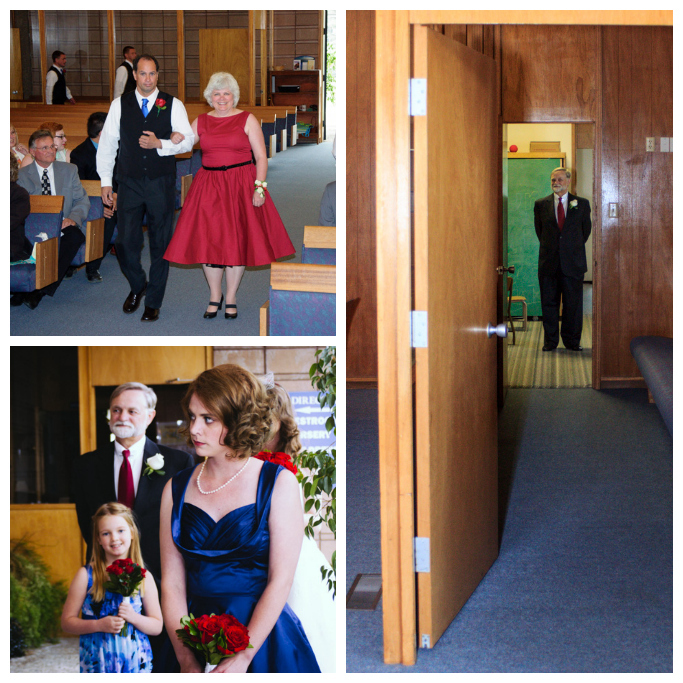 We chose to get married in the Cody Methodist Church, our new congregational home (we'd previously gone to the Methodist church in the town I'd been living in). The pastor of our old church had originally been contacted to marry us, since due to some scheduling issues our new one was unsure about dates. But as it turned out, we were "doubly blessed" so to speak, because they were both there to help marry us. It was a smaller ceremony, but so powerful to know the room is filled with people who love you and almost all of them had known either Amos or I since we were children. Above you can see My father checking on the time and crowd before the ceremony, my mother being taken to her seat, and my sister waiting her turn to walk down the aisle. 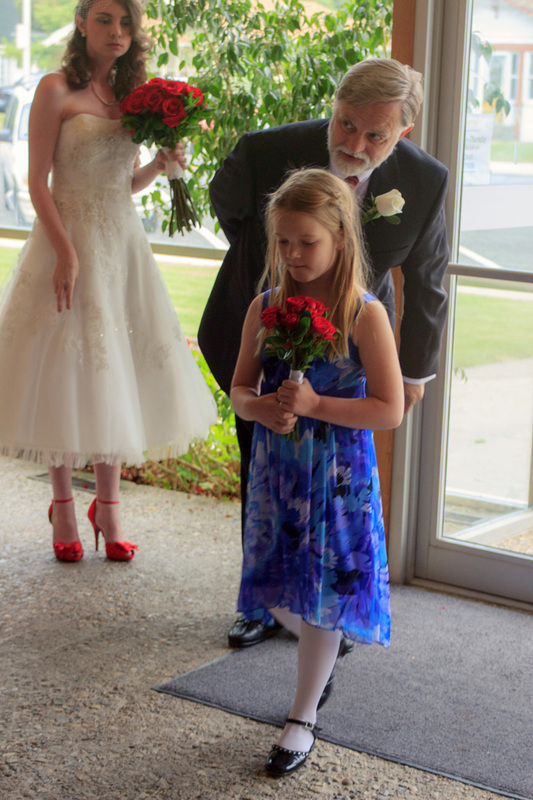 Then there's our niece Susie as flower girl. 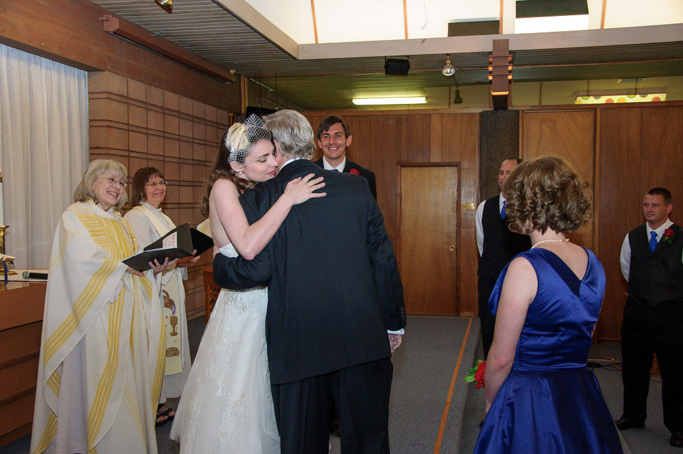 This photo of my dad encouraging her as she starts down the aisle is seriously one of my favorites of our wedding. She took her duties very seriously. After her, of course, it was our turn. The music has all been very classic up to that point, but when Jimmy Durant'e "Young at Heart" came over the speakers, starting "Fairytales can come true/ It can happen to you...," we started walking to my own fairytale ending. 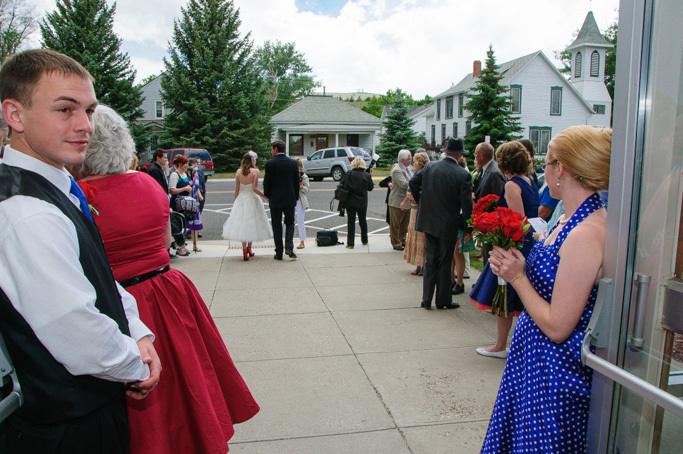 Our ceremony was very traditional, but we'd elected to write our own vows. 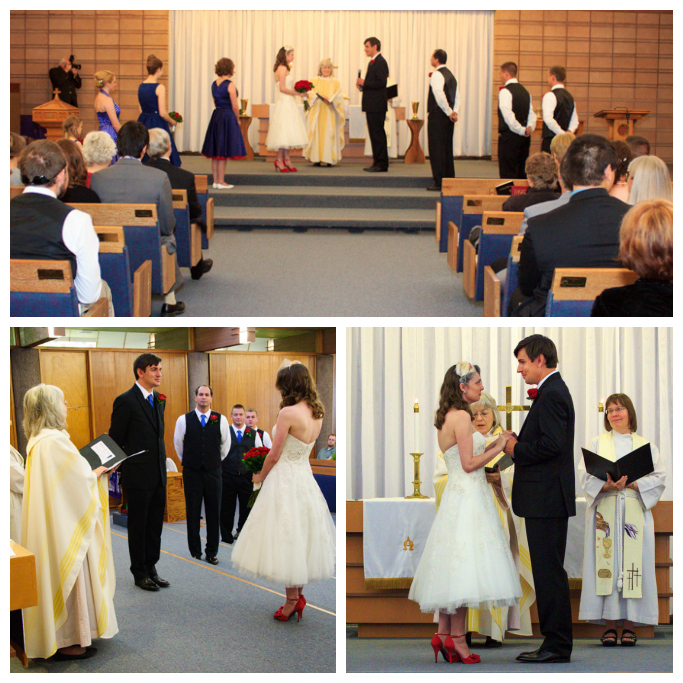 Amos had asked that the ceremony be the first time we hear or read each other's vows. He went first, and as a result I was pretty much cried through most of mine, unable to get emotions under control after his! Funnily enough, we'd both separately been super worried about remembering them all and had each spent most of the time before the ceremony silently repeating them over and over. Instead of a union candle or other, similar ceremony we chose to make the signing of the marriage license part of the ceremony. 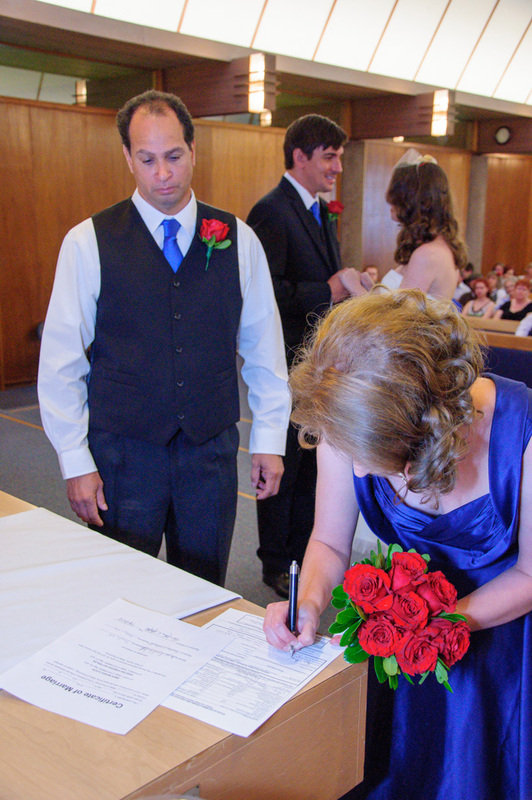 So our Best Man and Maid of Honor, along with the pastor each took a turn signing. After all our intents had been declared, our vows made, our rings exchanged, we kissed and were pronounced man and wife! As we were introduced to the crowd as "Mr. and Mrs. Olson" and Stevie Wonder's iconic "Signed, Sealed, and Delivered" started as we began to process out. It continued to play as Amos and I re-entered the room to dismiss the crowd by rows, therefore turning it into a de facto receiving line. It was nice to have those moments of hugs and private kind words with each person there. All the photos capturing people as they leave the church show just how much love was present in that one place! P.S. See more about the rest of our wedding here. What a beautiful post Kristian!! thanks for sharing this intimate part of your wedding. that's really wonderful so many people you'd grown up knowing could be present and i also love the shot of your dad w/ the darling flower girl. too cute how serious she took it all. you look absolutely gorgeous and i loved hearing the little details, like you were both worried about forgetting your vows : ). oh and your comment on my recent post made me laugh, i def dont consider it an androg look, just less girly. funny you mentioned it bcuz i went back and forth between writing "less girly" and androg. In blog-land though, it is kind of true. I definitely show myself wearing skirts more than pants and in real life, I think that pants-wearing out-weighs skirts or dresses. Funny, how that works! Aw I love that first paragraph :) So true, and so perfect. 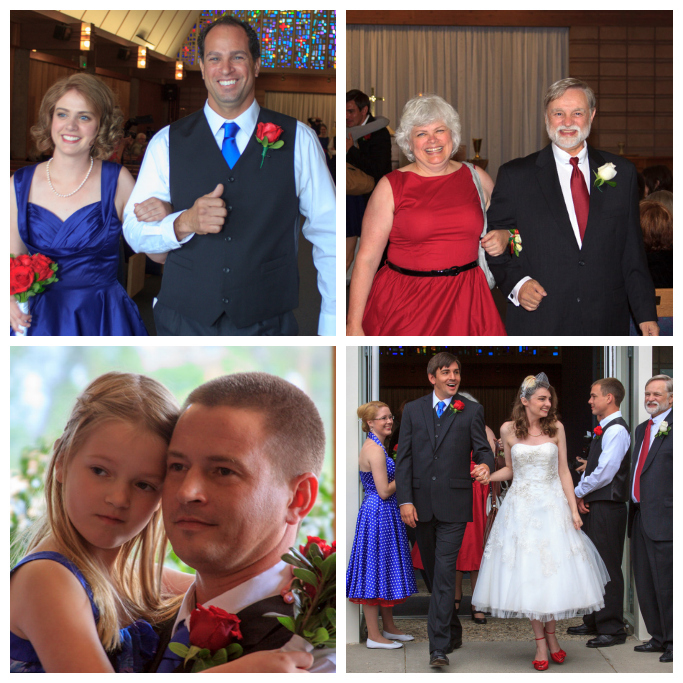 Awesome shots from your special day! I still just love your dress and shoes. And that veil is gorgeous as well! Just beautiful, Kristian! Yay! And thank you for reading. Hope you are having a good day today! Gah, everything about your wedding (I definitely went back and looked through the other posts too) is so, so, so perfect. I'm seriously just grinning like an idiot at work as I look through all of the photos! Oh Elana, you are too cute! Thank you! Oooooh weddings are too much for me, I'm getting teary eyed just reading your post! Congrats again, it looks like a beautiful ceremony. Oh, thank you so much Marisa! 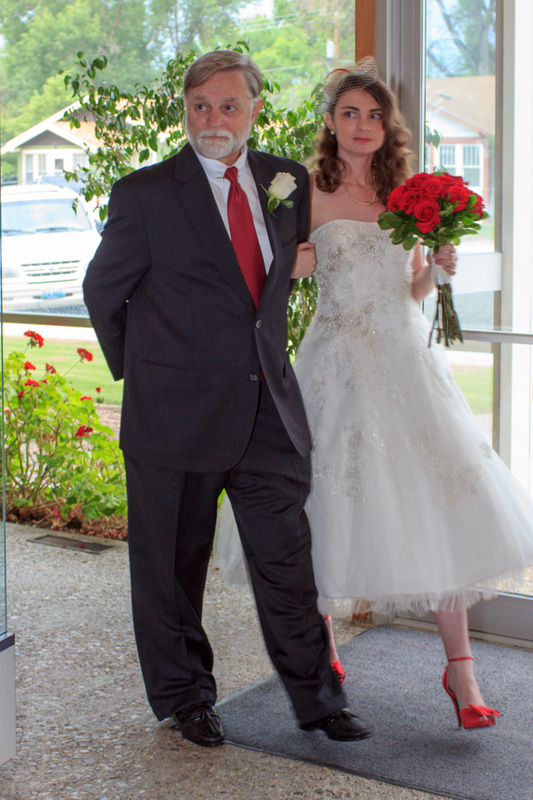 LOVE that you opted to wear those killer red shoes with your dress! You looked AMAZING! I like how you added some touches to your wedding ceremony to make it unique. Most of the weddings I have attended have all felt kind of the same. Well, I guess most would be similar since it is a sacred rite, in churches at least, but it was nice to have some unique touches! so so beautiful! I absolutely love those shoes! congratulations again my dear! I totally "awwweeeed" at the photo of your first kiss as man & wife!! Love that you're featuring your beautiful wedding so extensively on your blog! you look so so lovely here! the length of your dress is perfect! congrats on your wonderful day!